OXFORD, Miss. 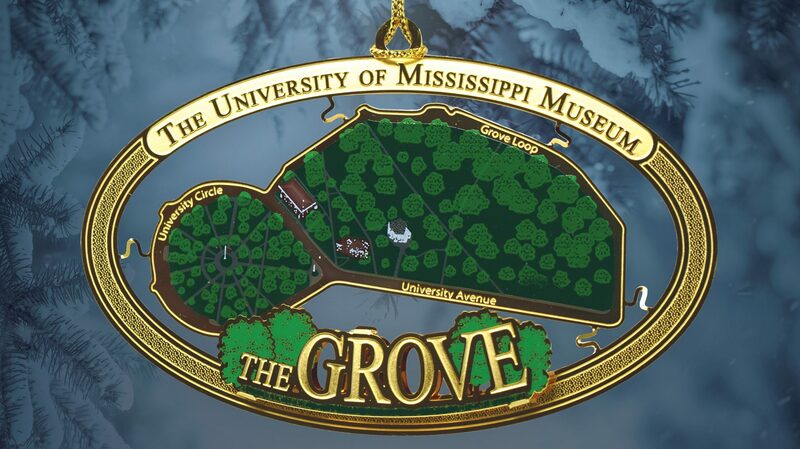 – The University of Mississippi Museum and Historic Houses has unveiled its 18th annual holiday keepsake ornament, celebrating one of the university’s most beautiful spaces and time-honored traditions, the Grove. The 10-acre green space in the center of campus, officially named the Grove in 1935, was first envisioned and implemented by Robert Burwell Fulton, UM chancellor from 1892 to 1906. When the university was building its first library, Ventress Hall, in 1889, Fulton extended the campus east, outside the “inner circle” toward the train depot, and planted trees and shrubs to beautify the campus. During his time as chancellor, Fulton worked to grow and preserve the lush landscape. In the 1950s, under the coaching of John Vaught, the football Rebels were a national power, and the Grove began to transform into the tailgate mecca it is today. Students moved their pregame festivities from sorority and fraternity houses to a more centralized location on campus. Fans parked cars, trucks, buses and RVs under the trees on game days until a massive rainstorm in 1991 forced the university to ban vehicles in the Grove completely. Today, the Grove is more than just one of the country’s best football tailgates. It hosts year-round community events, including the annual Summer Sunset Concert Series, and is the main venue for the university’s annual Commencement ceremonies. The Grove commemorative ornament is available for $25 in the Museum Store. Ornaments can be purchased in the store or by phone at 662-915-7073. Shipping within the continental U.S. is $7, and all shipped orders must be placed by Dec. 10 if needed by the holiday. All sales are final. Collectible ornaments from previous years, which are still available, include the Old Skipwith House, Brandt Memory House, Ventress Hall, the Lafayette County Courthouse, Oxford City Hall, the Ole Miss Women’s Basketball Jersey, the Theora Hamblett House, Theora Hamblett’s “Christmas Trees,” the Walk of Champions, Oxford’s Double Decker Bus, the Herakles Neck Amphora and the Barlow’s Planetarium. Previous years’ ornaments are $20 each. Museum members and Friends of the Museum get a 10 percent discount on all merchandise in the store. To become a member, visit http://museum.olemiss.edu/join-the-museum or stop by the museum. The UM Museum is at the corner of University Avenue and Fifth Street. Holiday hours for the museum store are 8 a.m.-6 p.m. Mondays through Fridays and 10 a.m.-6 p.m. Saturdays. Museum gallery visiting hours will remain the same, 10 a.m.-6 p.m. Tuesdays through Saturdays. To learn more about upcoming events, exhibits or how to support the museum, visit http://museum.olemiss.edu or call 662-915-7073.